Creation: Appeared in Nov 1957 (CTB) as a renumbering of part of VA 168. It initially ran like it does now, plus extended west on Little Creek Rd to Taussig Blvd, then northwest to end at VA 337 Hampton Blvd. This is the 3rd VA 170. Adjustments: In Jan 1979 (CTB), VA 170 west was truncated to its current end at Military Hwy. Little Creek Rd remained part of VA 165; most of Taussig Blvd became I-564 except the very northwestern piece which became an extended VA 337. Also, a small bit of non-freeway Taussig Blvd exists between Granby St and Little Creek Rd next to I-564. Improvements: VA 170 was paved upon inception. VA 170 was multilaned on its entire Little Creek Rd alignment upon inception. Posted: Fully posted; SR 170 shields in both directions on US 60 from at least 2007-16; VA 170 shields were still up leaving Gate 3 of the Naval Base as of March 2014. Comment: VA 170 provides primary access from Little Creek Amphibian Base directly (though now VERY urbanized) to Norfolk Naval Base (via VA 165 and I-564). VA 170 replaces VA 168. VA 170 truncated to VA 165. VA 170 #1: Appeared July 1933 as a renumbering of VA 514 from US 60 Lee Hall to Yorktown, then also continued east to Moore House, replacing VA 518. In Oct 1940 (CTB), VA 170 was renumbered as VA 238. Today it is still VA 238 except it uses SR 1020 right in Yorktown; the Battlefield Visitor Center erased some of this original routing; and east of there it used SR 676 instead of going to the Coast Guard Station. VA 170 Lee Hall to Moore House. VA 238 replaces VA 170. VA 170 #2: Appeared in Oct 1940 (CTB) as a renumbering of VA 27. It ran from US 17 Tabb southeast to Drummonds Corner near Poquoson on today's VA 134, then south via VA 172 Magruder Ave and Armistead Ave to Hampton, then duplexed with US 60 on Queen St and Tyler St across the Hampton River, then used today's VA 143 which VA 170 followed to Phoebus, but continued on County St and Water St down to Mill Creek. VA 170 then used VA 143's approach to Fort Monroe, then used Ingalls Rd through Fort Monroe down to the ferry landing at Old Point Comfort. 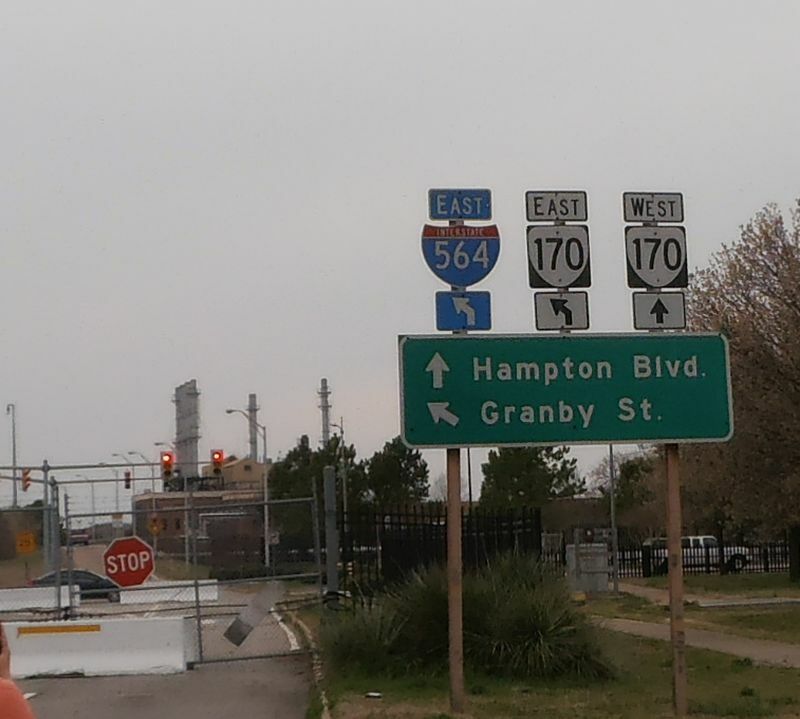 On the Norfolk side, VA 170 used Ocean View Ave to Granby St south to downtown Norfolk, then Princess Anne and Bank Sts, then Brambleton Ave southeast. VA 170 then followed today's US 460 down to US 13 Military Hwy, then used VA 166 and VA 190 over to Great Bridge. VA 170 then followed VA 168 Business down to just short of North Carolina where it picked up today's VA 168 for the last little bit. 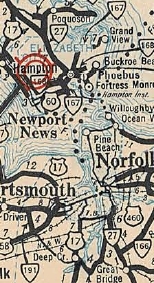 Between 1942-44, VA 170 north was truncated to US 60 Ocean View. 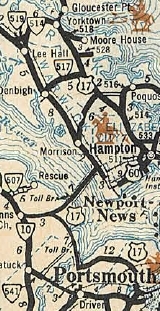 VA 170 was renumbered: VA 134 from Tabb to Hampton while the rest remained part of US 60. VA 170 replaces VA 27. VA 170 replaced by VA 134. 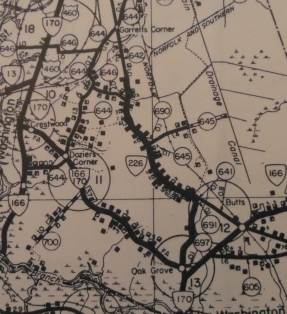 In Nov 1943 (CTB), VA 170 was rerouted between Great Bridge and South Norfolk to use VA 168 Business, Oak Grove Rd, a little Battlefield Blvd and Campostella Rd. This was partly new routing and a full replacement of VA 226. 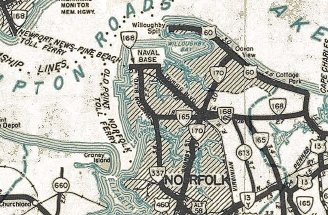 The old routing became VA 166 northwest of Great Bridge, VA 166-Y, and a rerouted US 460 through Portlock and South Norfolk. In Nov 1957 (CTB), VA 170 was renumbered: US 460 on Granby St and VA 168 from South Norfolk down to North Carolina (some of the VA 168 pieces are no longer primary).